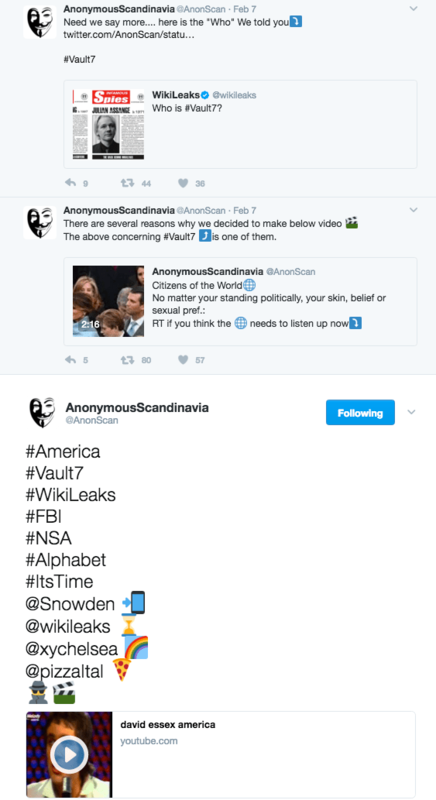 Who and Why is Vault 7? UPDATED FEBRUARY 10, 2017: I’m not sure if it has to do with Vault 7 but Wikileaks has now tweeted out two articles about Chelsea Manning receiving funds when she is released from prison. The first tweet was a link to an article explaining how Manning will get thousands of pounds when she’s released because of a fund her friends have set up for her. The second tweet links to a “Chelsea Manning Welcome Home Fund“ which anyone can donate to—the goal is $100k and the fund is halfway there. Again, may not have to do with Vault 7 but it’s a good head’s up to those who would like to donate. The book they are most likely referring to is “When Google Met Wikileaks.” If you read the Wikileaks article I linked to earlier (HERE), you probably noticed how insidious Google, Alphabet, Inc., Jared Cohen, and Eric Schmidt have become—I’m talking they’re knee deep in foreign affairs and probably the Deep State. It’s not a joke. And realize, Google was helping Obama back in 2008 and perhaps they were buddies with the Clintons’ well before that. “The Five Eyes agencies are playing a dirty game. They have found ways to infiltrate all aspects of modern communications networks: forcing companies to hand over their customers’ data under secret orders, and secretly tapping fibre optic cables between the same companies’ data centres anyway; accessing sensitive financial data through SWIFT, the world’s financial messaging system; spending years negotiating an international agreement to regulate access to the data through a democratic and accountable process, and then hacking the networks to get direct access; threatening politicians with trumped-up threats of impending cyber war while conducting intrusion operations that weaken the security of networks globally; and sabotaging encryption standards and standards bodies, thereby undermining the ability of internet users to secure information. Am I the only one thinking that that is a shiz ton of agencies and employees around the globe that could be filtering data back to Wikileaks? On February 8, 2017, Wikileaks posted a picture taken on February 27, 2013, of Staff Sgt. Boyd, 509th Civil Engineer Squadron structural supervisor, welding a box blade for a snow plow. The caption reads, “Why is Vault7?” The photo was taken at Whiteman Air Force Base located in Missouri. See HERE and HERE. The Outer Dark theorizes that the Staff Sgt. is actually the same person that was redacted in the FBI/HRC investigation documents. We could on about drones. Mother Jones reported that Hillary Clinton’s unsecured server contained classified information that may have included drone strikes. In a 2013 article, they also reported on Obama’s acknowledgement of the government’s drone program during a January, 2012 Google+ Hangout session. Less than a month ago, Whiteman AFB sent out B-2 bombers and launched “drone-launched hell-fire missiles” in an attack on two ISIS training camps in Libya. In 2013, Google funded a $5 million grant for a drone program to stop illegal African poaching—a noble act but I can only assume that Google is also funding some insidious drone programs. Hopefully more to come. Here’s another article I found about drones coming out of Whitman, as well as Arizona (which takes us back to David Essex’s song “America”). And, if you didn’t see the background information I added to the February 2nd “Alert” video, Whiteman AFB is the base that two B-2s flew out of before dropping dummy bombs on an island near North Korea in an effort to send them a message. The picture of the crowd gathered at Kim II Sung Square that was used in the “Alert” video captured the North Koreans’ support of Kim Jong-Un’s declaration of war against South Korea and the United States. Is anyone else getting the feeling that someone has their finger on the button like, now? As for the video hint below (the video with the Donald Trump interview about 9-11), after you read this update, I want you to keep in mind a few things. In the video a screenshot of Edward Snowden’s tweet, “Can you hear me now?” is shown which leads me to two conclusions: It’s either a nod to the documents Snowden leaked about Verizon (meaning, NSA surveillance), or it’s basically Wikileaks asking the world, “Are you listening yet? Do you not see what’s going on?” Or maybe it’s both. The video also asks, “…you may still wonder…How is #Vault?” and the screen pans on a Wikileaks page which states, “global defense of sources and press freedoms…” Notice that this is basically a hint to the Wikileaks clue that came out the very next day. And it’s not the first time @AnonScan put something out there that hinted at future Wikileaks clues. So for those of you that are still skeptical about @AnonScan’s legitimacy I wouldn’t worry about it too much (Wikileaks later acknowledged @AnonScan on Twitter). Two other things I want to note that are in the video. One is the other Edward Snowden tweet that says, “Did you work with me? Have we talked since 2013? Please recontact me securely, or talk to @bartongellman. It’s time.” This tweet was originally posted on August 3, 2016 and remember when I said Snowden might have kept a little something something in his back pocket from NSA? Well, maybe he didn’t and instead passed along some data for someone else to hold. Or maybe he’s had contacts in the NSA this entire time that were willing to continue leaking data and documents.. I have to wonder if Assange received newly leaked material towards the end of 2016 that can be used to free him and pardon both Manning and Snowden. Newly elected President Donald Trump, however, didn’t even want Manning’s sentence commuted so we’ll see how this plays out. Finally, the last thing we see on the video is “We urge you to make use of #Vault7…” This makes me think that Vault 7 is indeed a Wikileaks’ database and they want us to “make use” of it. Meaning, prepare for the leaks, read the documents, and spread the word. Maybe this goes back to the Svalbard Global Seed Vault and that Wikileaks has a “counter-purrveilance” database on the NSA (which, isn’t that essentially what they’ve been all along?). Hmm. As to the interview with Trump about 9-11, I know people are desperate to have information leaked that might show the U.S. government was behind the attacks. I’m not 100% convinced ye that that kind of evidence is in Vault 7—although if it is I would hope it comes out. The clues pointing to 9-11 may just be a hint about the Patriot Act and the development of NSA surveillance programs that grew out of the attacks. Fingers crossed, though. “The World Trade Center was always known as a very very strong building. Don’t forget that took a big bomb in the basement (1993). Now, the basement is the most vulnerable place because that’s your foundation and it withstood that and I got to see that area about three or four days after took place because one of my structural engineers actually took me for a tour because he did the building and I said “I can’t believe it”. The building was standing solid and half of the columns were blown out. This was an unbelievably powerful building. If you don’t know anything about structure it was one of the first buildings that was built from the outside. The steel, the reason the World Trade Center had such narrow windows is that in between all the windows, you had the steel on the outside, the steel on the outside of the building. That’s why when I first looked – and you had these big heavy i-beams. When I first looked at it, I couldn’t believe it, because there was a hole in the steel and this is steel that was, you remember the width of the windows of the World Trade Center folks. I think you know if you were ever up there, they were quite narrow and in between was this heavy steel. I said how could a plane, even a plane, even a 767 or 747 or whatever it might have been, how could it possibly go through this steel? “I just think that there was a plane with more than just fuel. Obviously they were very big planes. They were going very rapidly. Because, I was also watching where the plane seemed to be not only going fast, it seemed to be coming down into the building so it was getting the speed from going down hill, so to speak. It just seemed to me that to do that kind of destruction, is even more than a big plane because you are talking about taking out steel, the heaviest caliber steel that was used on the building. These buildings were rock solid. “What remains now, is time. #ItsTime and you may still wonder…How is #Vault7? They also tweeted out a video entitled “We have the chance to turn the pages over.” Is that Assange lip-syncing to it brilliantly? Here are lyrics to the song. Not sure if this correct. Any help? Thanks!